The official University Regalia can be purchased from Barnes & Noble University Bookstore. 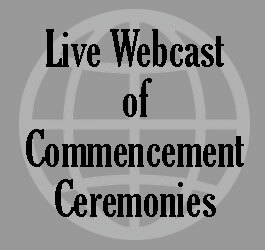 You must have your regalia to participate in the commencement ceremonies. *For doctoral regalia, please contact the bookstore to make arrangements to pick up. The academic costume worn at official functions today originated in the universities of the Middle Ages, when a warm gown and hood were useful for scholar and cleric in unheated buildings. By modern times, the growth in number of universities cause a great deal of confusion in academic regalia and in 1894-95, a commission brought some order into the chaos. The American Council on education subsequently effected more improvement since 1959-60. The mortarboard cap, which generally prevails in the United States, originated at Oxford. Cambridge, European universities, and some Latin American universities use other types of caps, which are of course legitimate for wear in any American processional when the individual hold his degree from one of these institutions. Gowns are generally black, although some few universities depart from this practice. The bachelor's gown is simple, with long pointed sleeves. The master's gown will have either long sleeves with narrow wrist opening or long sleeves with the hand emerging from the sleeve at about elbow length. The doctor's gown is fullest in cut; it has velvet panels down the front and around the neck, as well as three bars of the same material on the bell-shaped sleeves. The hood indicates the level of the degree, the faculty in which it was given and the institution that granted it. Degree level is indicated by length: the master's hood is three and a half feet long and the doctor's hood is four feet long. The velvet trim on the exposed edge of the hood is three inches wide for the master's degree and five inches wide for the doctor's degree. The color of the trim indicates the field of study. A color, or color pattern, between the trim indicates the university granting the degree.